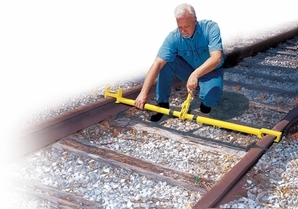 Grabs rail head to pull or push rails into desired gauge. Can be used in both regular track and within switches. One end of the Spreader has a double jaw, one of which is offset to lift Spreader above switch point or heel block. Gauge adjustment range 16 inches. Reversible ratchet wrench with flip key to change movement direction. Useful for correcting track after derailment and when installing gauge rods.